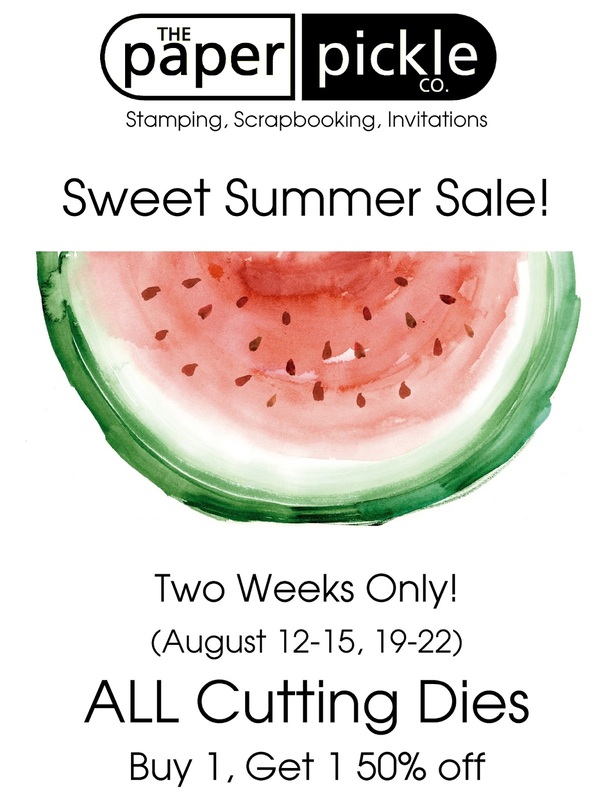 SWEET Savings - 2 Weeks ONLY! 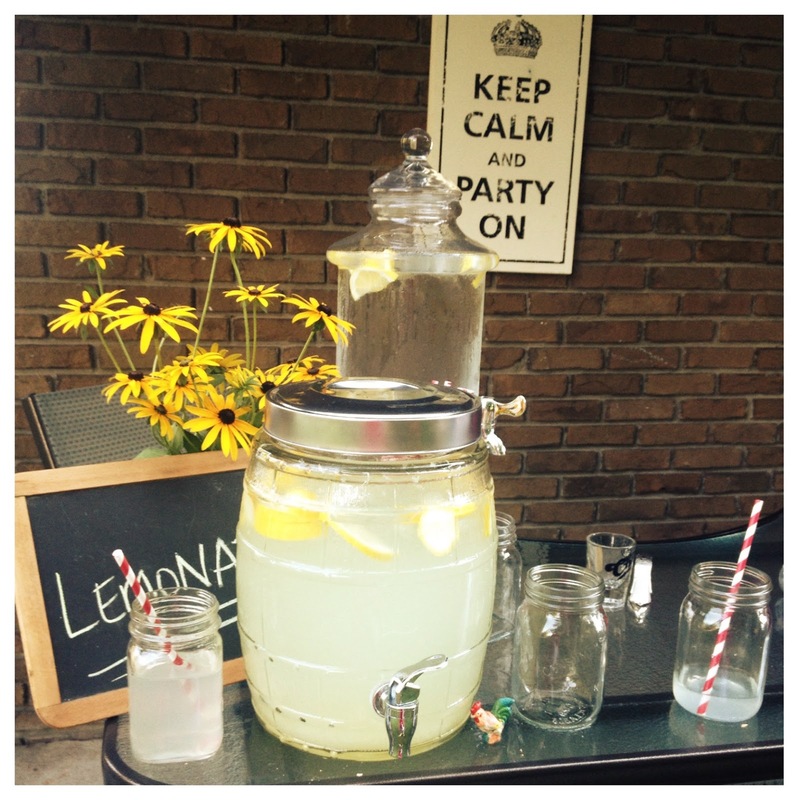 and lemonade add to the theme of the party! I mentioned last week that I was busy planning a party at our house. Every year, we host a fantasy football party. The league has been running since 2002 and the boys pick their players who will essentially be on their "fantasy team". To be honest, I really do not care at all about the football part of the day. I am not a football fan and I never will be. What I do like about football season, however, is that it gives me license to do whatever I want every Sunday throughout the fall....and that usually means crafting! So you are probably wondering why I get all worked up every year about this football party when I don't even care for the sport. What I do live for is planning a FUN party that will be memorable for all our guest. Each year I have a little more fun planning and decorating. We have been choosing "themes" for this football party for a while now with the theme usually revolving around the food served. This year's theme was "Ol' Fashion Southern Picnic". I even made some without the rub and it was perfect for the kids. And of course - Lemonade!! 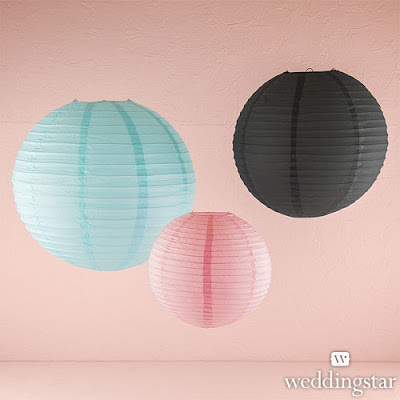 It is easy to wow your guests with a few simple decor items including paper lanterns. I chose red and white to match with my theme and my table linens. 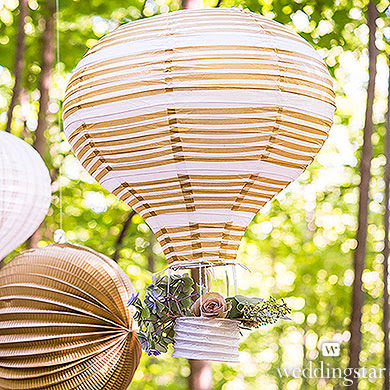 You will also notice I decorated with the fun hot air balloons which were also perfect for this theme. Notice how cool they look hung from our huge maple tree! I usually hang these with fishing line but since I couldn't find mine, I used baker's twine and that looked really cool. Simple items like wooden crates (found at Degoey's in Chatham) can serve as wonderful decor items with a purpose.....perfect for catching empties! 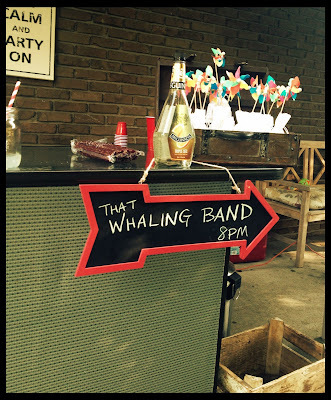 I was also very happy with this chalkboard arrow sign that told guests what time the band came on. I wanted to do something special for the kiddies. 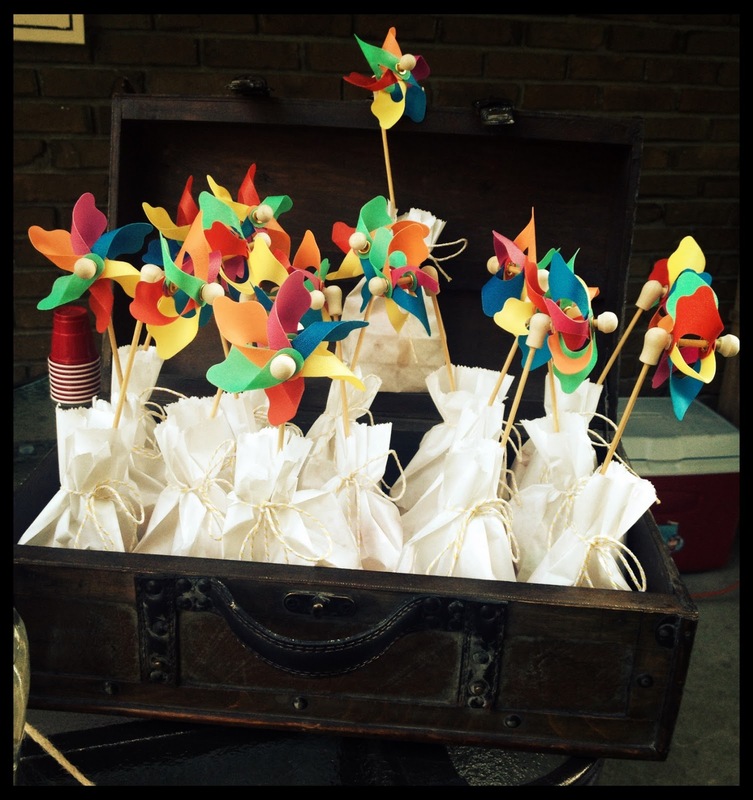 Jules (my daughter) and I whipped up some paper treat bags tied with baker's twine. Contents included ol' fashion lollipops, gum balls, jubjubs and fun pinwheels. I found these pinwheels at the Superstore a year ago on clearance for $0.14 each! They were the perfect addition to the bag and made for a very fun visual. They were even spinning away throughout the day....how fun! 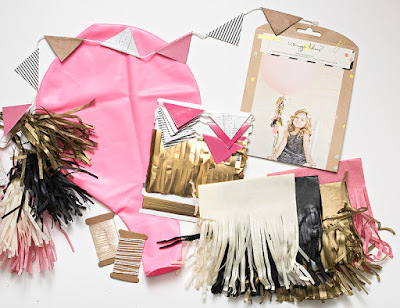 These could very easily be made out of scrapbooking papers if you like. 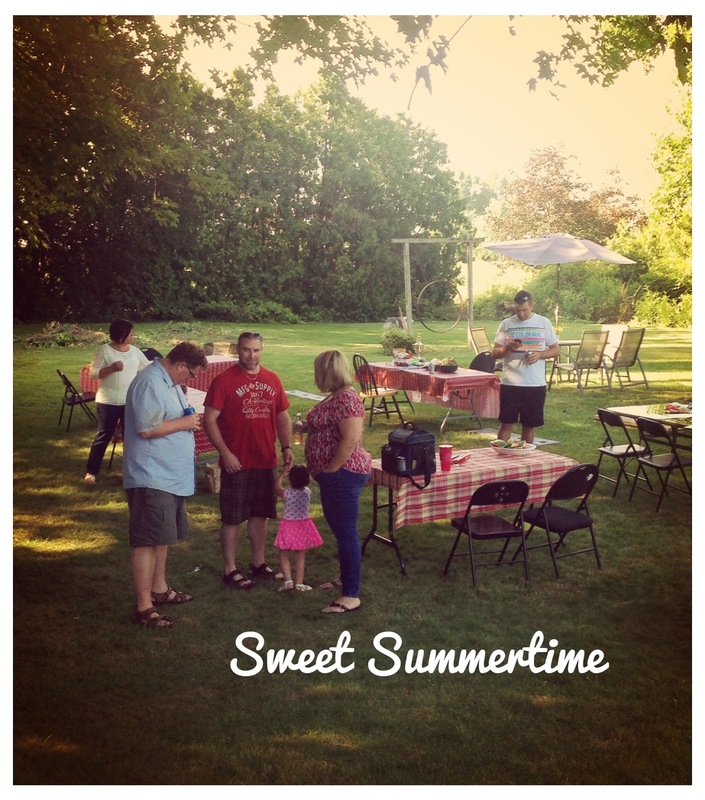 The weather was perfect and a good time was had by all. I really wish I had more photos of all the little details but this is all I took between prepping food for the 50+ people and when I cut loose once the meal was done. And did I EVER cut loose. Yikes! Remind me next year to cool it a little, will ya? I'm not as young as I use to be. Ha. Yes, there is a reason why I shared my little party with you. It is to show you that you can easily transition your love of paper and pretty things to party settings. 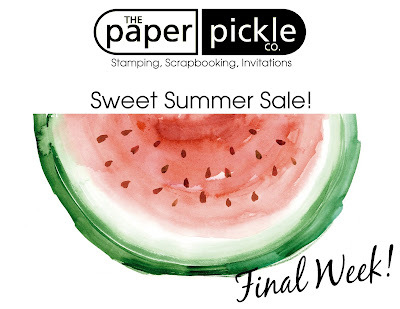 Maybe you have been doing a little less in terms of scrap booking or card making and that's ok. But there are always gatherings. There are always small ways to make your guests feel loved. Little things like making washi tape flags for your desserts, stringing fun paper bunting or paper lanterns above a cake table or creating a fun memory guest book! I know you can use your amazing eye for colour and details to add that WOW effect to your next event. You will be happy to learn that the whole "fam damily" is back in stock! We have missed you. After an incredible run in 2014, we were patiently waiting for the 2015 season to start so pickling could begin. All cucumbers are grown locally in Chatham-Kent. They are then graded at the Chatham facility which employs hundreds of students each summer. They are then packaged in Harrow, Ontario. I remembered working at The Pickle Station each summer. Because my family ran the operations, we spent the majority of our summers working. I believe it was there that our characters were built. We learned that when it was time to work, you worked! We grew up in an entrepreneurial setting and I am proud to say that each of us (5 kids in all) are business owners. Our Grandpa ("Grandad") started the "Pickle Station" 50+ years ago and it is so incredible that it still around giving "kids" the opportunity to blossom and grow. And yes....this is where the name "The Paper Pickle Company" came from. My sister Kell and I wanted our business name to have meaning and reflect who we were. AND it is true....We all LOVE pickles!! Dig In. Eat Fresh. Buy Local! This is it! 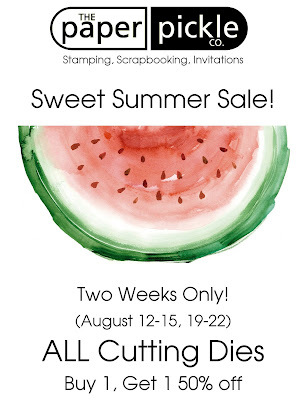 THREE days left to save BIG on all in stock cutting dies. We have a beautiful selection from companies including: Memory Box, Impression Obsession, My Favorite Things, Art C, Spellbinders and more! 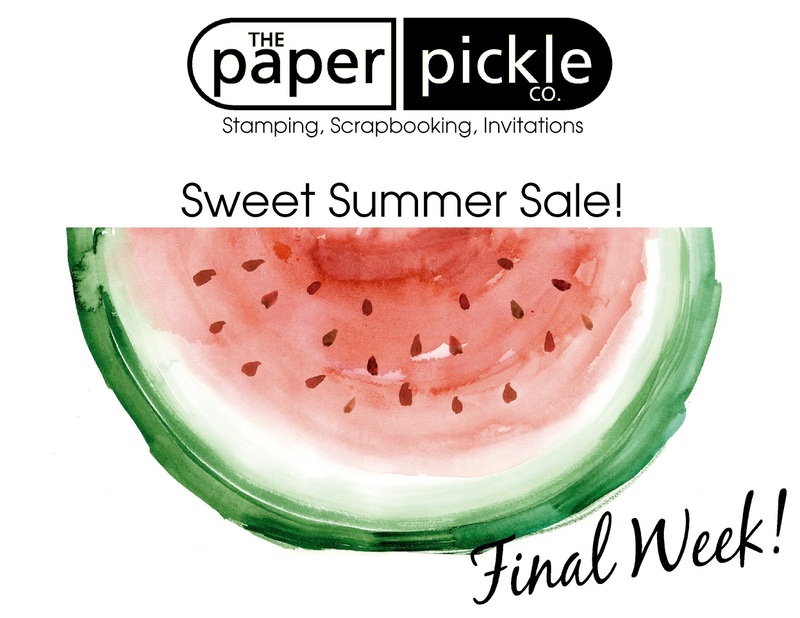 Sale ends - Saturday August 22! Hope you are having a great summer. I am busy prepping for a good ol' fashion southern picnic themed party. I cannot wait to share my photos with you next week. Let's see if I can pull this one off! This is the time of the year when everyone yearns to be outside. Every party seems to be set outdoors, making the most of the beautiful weather and lush surroundings. 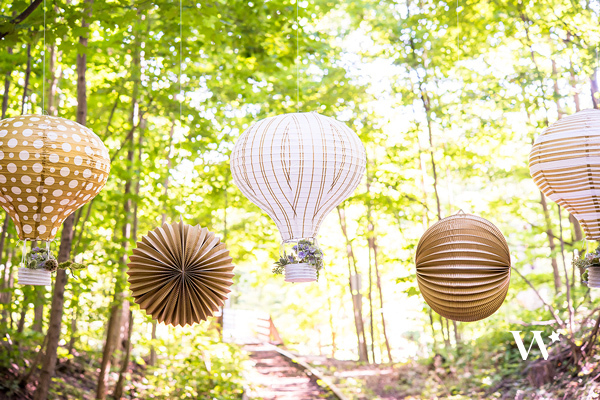 Why not have a little fun when you host your next outdoor soiree and bring your love of paper outside? Check out these great paper hot air balloons we have in stock! They come as a three pack for $20.95. You can see you get three coordinating patterns with white and gold designs. If you have been in the store, you will see these beauties floating by. 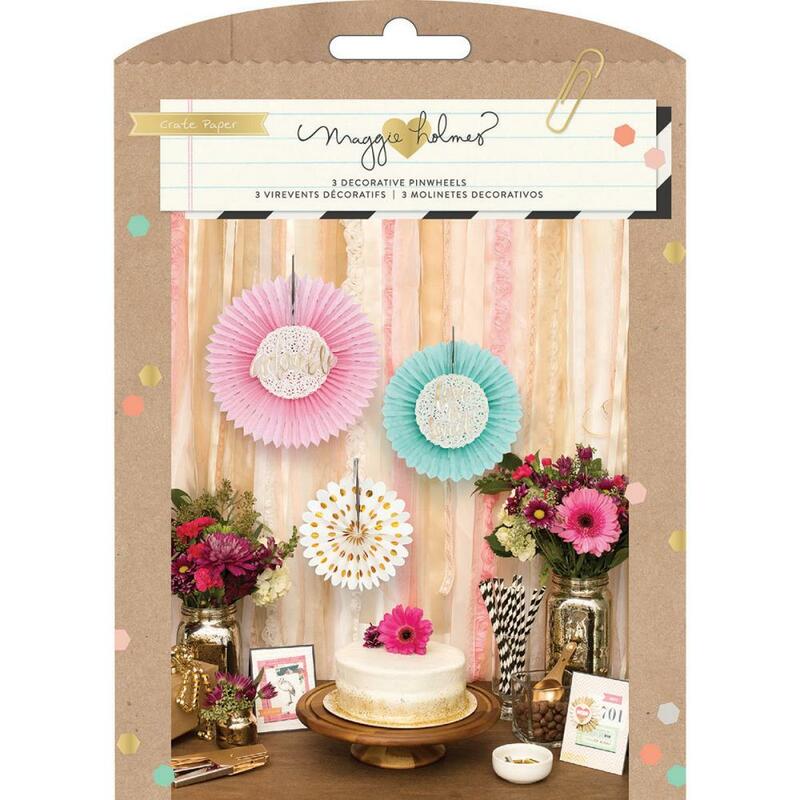 Now this party garland is much bigger with the 3D circles being 6" in diameter. 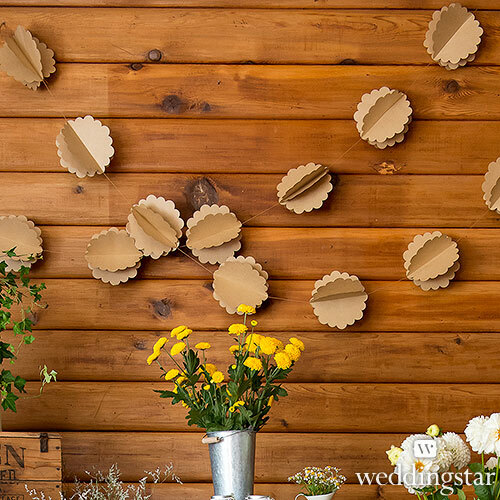 They make a big statement at a rustic themed party. These too can be altered using crafting products. 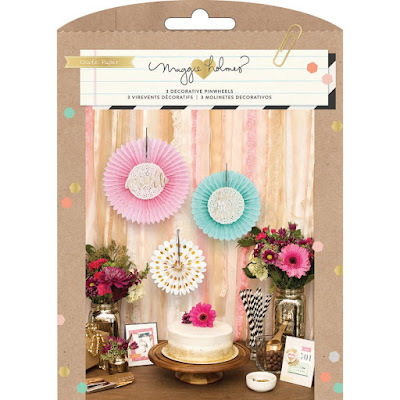 The garland measures 6 feet in length ($8.99). 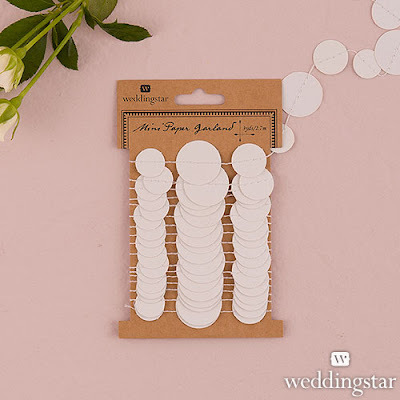 This garland is not 3D like the kraft style above but I love the two alternating sizes of circles (4-6") and the matte card stock used is perfect for stamping and altering. I HAD to bring this baby home with me. I am just itching to have a little fun playing! These paper lanterns have been a staple in the store for some time now. With over 20 colours and three sizes, you are sure to find the perfect colour combination! Sizes include small (12" - $2.50), medium (16" - $3.50) and large (20" - $6.00). I hang these in my huge maple tree for our annual football draft party and I love watching them sway in the wind. A subtle touch but I know the guests notice. Have a look at this romantic party photo I found online. 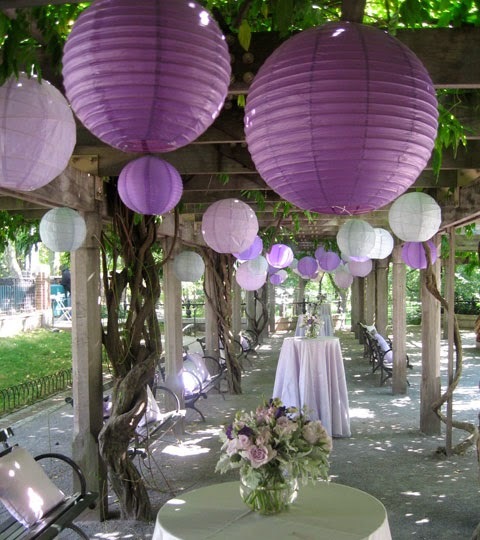 The lanterns add a touch of whimsy, making the guests feel extra special and making for one memorable event. These tissue fans by Maggie Holmes are awesome. There are three styles in the kit for $12.99. I love this idea on the packaging which shows how you can use this item to create a focal wall/display at a party. 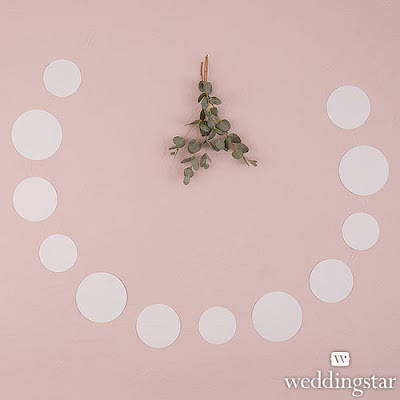 This garland is back in stock and I am so in love with it. 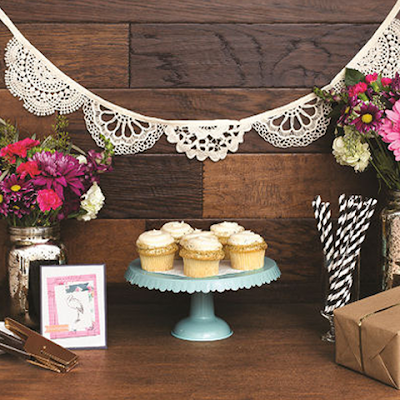 It is a real crocheted garland SO perfect for a vintage bridal shower, or hang it in a bedroom. It is truly beautiful. ($12.99). Now these are not paper and these are not decorating items exactly but I HAD to post these. 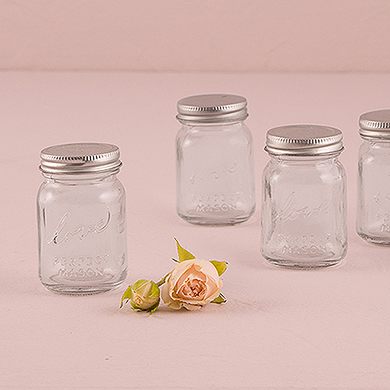 These mini mason jars are brand new to the store and I am in love! They measure only 3.25" in height but the lovely "love" design in the glass scores BIG points with me. Fill them with candies for your guests as favours, use as fun condiment containers at your rustic BBQ or use as storage in your craft room. The possibilities are endless. Only $0.98 each. So what do you think? 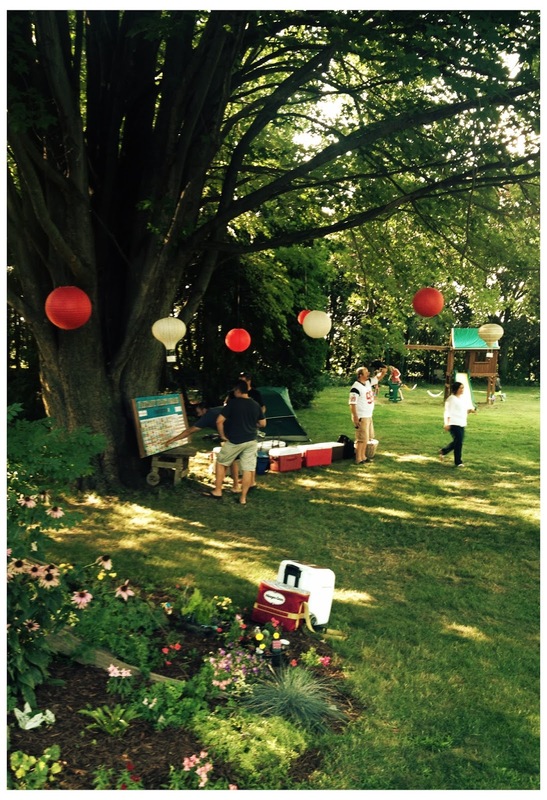 Are you now planning your next party?! ?